I don’t normally do this, but I’ve had several requests for my preliminary thoughts on this pen. These are my initial impressions. A more thorough review is a few weeks out. I generally like to live with a pen for a good while before drawing my conclusions. 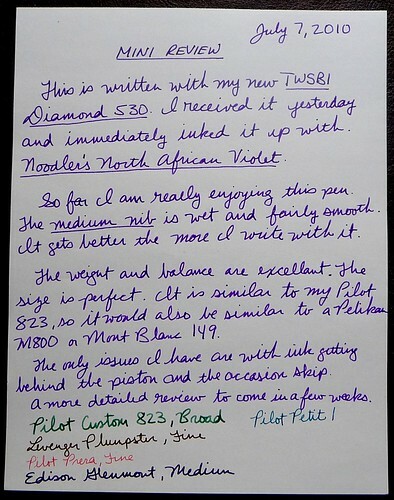 I will say that I am impressed by the TWSBI Diamond 530 in spite of a couple issues. NOTE: TWSBI has informed the pen owners of an issue with the piston seal. If your TWSBI is leaking at the piston seal please email Speedy about getting a replacement part. For more information click here. For some reason I wrote Mont Blanc 149. I meant to write Mont Blanc 146. The 149 is HUGE. The TWSBI is not nearly as big. Sorry. ← I Just Purchased a Manual Typewriter! I’ve heard about TWSBI pens but have been wondering about the quality. If it’s as big as a Pelikan M800 it might be too big for my taste. I’ll be looking forward to your complete review! ‘Speedy’, the guy behind TWSBI, has posted for months on the development of the pen and has involved the community all the way along. The seems to pay close attention to detail. Once the piston seal issues are sorted the only weak link ought to be the nib as that’s bought in. Some folks have called the nib a bit toothy before smoothing. I’ll reserve judgement until mine reaches the UK! I agreed wholeheartedly. One of the most appealing aspects of this pen is that it is made for us by us. Awesome. Wonder why we never saw a full review? It’ll actually be up tomorrow. I was waiting for the 1.5 replacement piston seals to come in.